Scientists, scholars and academics have yet to define genius, yet the concept is rightly applied to those exceptional individuals who, through their art, their science or their enterprise, create unique changes in our thinking, or our broader-world. Genius carries a certain mystical quality, distancing it from even that which we call exceptional. Those to who the term is applied are often seen as outliers, perhaps even crazy- but their minds have created the structures, technologies, treatments, cultural artefacts and concepts that we take for granted as being our world. Another way to understand their importance would be to imagine a world in which they hadn’t existed. What if Franklin and Faraday had never pondered electricity, Edison had never conceived the light bulb or Fleming had never realised the benefit of mould as the antibiotic we now call Penicillin? From Gates to Jobs, Ellison to Bezos and Zuckerberg to Musk; our modern world is littered with individuals rightly described as exhibiting genius, who have created hundreds of millions of jobs between them, and contributed more to the story of global growth than perhaps any other such-cohort in history. To learn more about the true nature of genius, I spoke to Doug about this incredible journey. Q: What made you choose to document Silicon Valley? [Doug Menuez] I was an accidental witness to history, it wasn’t technology that intrigued me; but rather the question about who these human beings were… who was this hidden tribe that had the power to change our lives? [Doug Menuez] Genius is (possibly) the presence of more- or more closely packed- neurons. I once held a chunk of Einstein’s brain, the scientist who was dissecting and analysing it told me the neurons were closer together. We don’t really know if that makes thinking faster… but when I sit with true brilliant people and watch them have conversations, they seem to have the ability to recall important bits of information, put the puzzles together, and see patterns faster. They can function on a very high-level. Does that make them wise or give them emotional intelligence? No, that’s often lacking. It’s often said that many of the people in the valley are on the autism spectrum… They’re highly functional in many areas (such as their technical tasks) and lacking in others. I’m very interested in human behaviour and culture; and it’s clear to me that these people created their own new culture as I was shooting them- this influenced wider culture and changed the nature of work globally. They built computers, invented and innovated… they pioneered flattened hierarchies and built global businesses. Q: What was the motivation of the individuals you photographed? [Doug Menuez] What is worth doing with your life? What would you sacrifice to accomplish your dream? On one level, the motivation was just the sheer adventure of inventing something new, something that had never been done before, and to actually accomplish the impossible. Often, the tasks these guys set out to do were considered too hard. Steve [Jobs] was told several times that he was working against the laws of physics…. People would say to me, “I want my Mum to be able to use this…” or “I want kids to have computers in Africa…” or “I want to improve human life….” these people were idealists and had an altruistic bent to improve our lives. Guess what, it turns out that you can’t make big-breakthroughs without crazy optimism and idealism! With the exception of Elon Musk, that attitude is largely missing right now. As I look out on today’s landscape in Silicon Valley in Europe I see that idealistic entrepreneurs of all ages simply are not getting the funding to support hard ideas and hard science for long-term projects. There’s a new wave of innovation coming… but this may manifest itself somewhere like India, China or further afield then Silicon Valley. 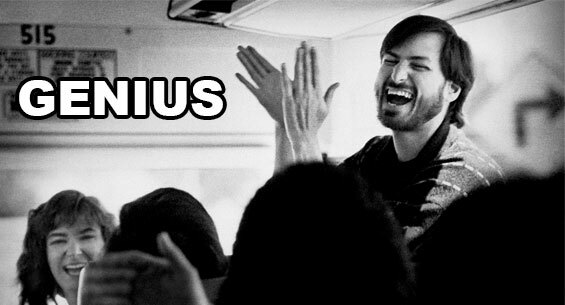 They talk about Steve Jobs having a reality distortion field…. but all the entrepreneurs I met who achieved great things had that. They all had a wilful denial of reality… against all evidence to the contrary they had to believe they would succeed.. that’s ultimately what entrepreneurs do. The entrepreneurs I photographed made huge breakthroughs… they created millions and millions of jobs and scaled up whole economies. Q: To what extent was money a motivator? [Doug Menuez] From the guys who started Adobe to Steve Jobs, and everyone in between…. for the people I documented, money was secondary… They knew absolutely they would make money, but changing the world and doing cool stuff was the primary goal; that was their mission. That was in the early days, however by the end of the 1990’s it was all about the money… and I don’t think it was coincidence that a crash happened. Today, people haven’t really got a mission… they’re not aiming to go to Mars, they’re not signed up to do the impossible. If you’re an entrepreneur and focussed on money, that’s probably driven a lot by the investment side of things because you just got funding, and you have to deliver revenue. Wall St also drives a quarterly profit demand, and so companies don’t think long-term. It’s a gold-rush mentality that can create bubbles. I really believe that firms have to look at the longer-term. In Japan, some businesses have 100 year business plans. Invention has to be about the dream, there’s an ingredient which you can’t put in a business plan- it’s intangible- but I saw it, it was there. Q: What were the most inspiring or life-changing moments on the journey? [Doug Menuez] Steve Jobs forced me to figure out what was important to me, and who I was. He demanded that everybody in the room had to be at the top of their game, the best in their field… He was challenging people every day to do their best work and rise above their own talents. He hired the most brilliant people and pushed them to go further. I knew some day he would challenge me, but I didn’t know when or why. By the time I embarked on this project, I had already done a lot of things including documenting warzones, conflict, famine, crime and more; but even then… Steve was terrifying. I had to go through a process to know who I was, I couldn’t hide behind my camera. Steve Jobs made people feel completely exposed and vulnerable, he could see right into you, to what you’re made of. Another powerful moment was when we found out that one of the engineers at Apple had shot himself after brutal round-the-clock workload for a couple of years on software. He had to rewrite a bunch of code and just snapped. That showed me the level of sacrifice used to invent this stuff that people on the outside just aren’t aware of. Companies hide this very well. Q: What did you learn about the mental states of the people you documented? [Doug Menuez] I saw a lot of complicated, conflicted, neurotic people; but there was also a huge trend in the younger generations to work extremely hard on things they thought were fun. There was a lot of fulfilment and pleasure, and they partied hard. Each generation since the 1980’s has brought more balance to their lives- something that was missing in people I photographed. Today you see the opposite… the millennial generation puts a premium on quality of life and now companies have services to attract and keep people working there such as day-care, dentists, massage, cafeterias, gyms and more- all on campus. A lot my peers thought I was crazy to be there instead of covering conflicts Africa. I simply felt these people were onto something…. It was incredibly hard to get past the PR bubble, but Steve gave me an incredible gift; it was a seat at the table to see huge decisions. At the time it wasn’t always obvious what was happening or how decisions would turn out, and so it became about finding your mission and never giving up; no matter what. Like it or not, genius is something which is inherent- it is a complex and often burdensome gift that distances the individual from the rest of us. It would perhaps be a folly for us to attempt to become genii in our own right, however learning what makes these exceptional individuals function and thrive can give us huge insights into how we can make our own lives richer. In my own life, I have been lucky enough to meet people for whom the description genius is the only appropriate description. Through my own businesses, and through my work writing the journal Thought Economics, I have been able to have one to one conversations with many of the individuals who have shaped our century, and others who will have a big influence on our future. Find the things worth doing in your life. Make those things your mission.